Miss Berry explains that she may attend the Conference on Narcotic Education in Washington, D.C. on Nov 3, 4, 5, and 6th, but she will not have time to prepare a presentation. 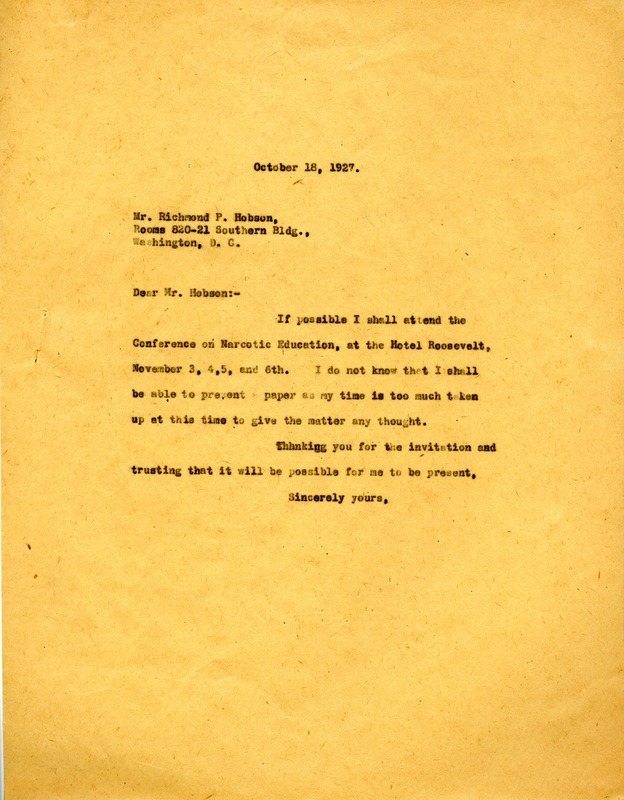 Miss Martha Berry, “Letter to Richmond P. Hobson from Martha Berry.” Martha Berry Digital Archive. Eds. Schlitz, Stephanie A., Meg Ratliff, Garrick Bodine, Bob Williams, et al. Mount Berry: Berry College, 2012. accessed April 20, 2019, https://mbda.berry.edu/items/show/4549.